In August 2002 we adopted Cinder from you. The reason I'm writing is to let you know that last week Cinder passed the exam to become a Certified Therapy Dog! 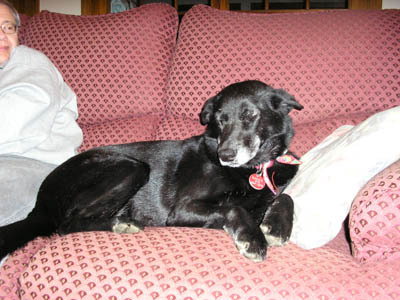 Cinder was fostered for the first 2 years of her life by Ruth Brown in North Carolina, who took her in when someone found her as a puppy hiding under a truck. I would love to have Ruth Brown know that Cinder is now a Certified Therapy Dog. Ruth always knew what a special dog Cinder is and this is just one more thing that proves her right!! I'm hoping you can forward this email to Ruth so she knows the goods news. I'm sure Shirley knows how to get in touch with Ruth. I took Cinder to class for 8 weeks and we practiced at home. Well ..... she passed the test with flying colors! So Cinder and I will be heading out to visit some local nursing homes each week to cheer up the residents and let them see what a wonderful, sweet dog Cinder is. As soon as I receive her "official certificate" and her "photo ID" (which she has to wear on her collar when we go visiting hospitals and nursing homes), I will send you a picture. Cinder continues to be such an important part of our family. We can't imagine life without her. We continue to ge so grateful to Ruth Brown for giving her such a great start in life. We're convinced this is why she's such a sweetheart. And we're grateful to Save a Dog for introducing Cinder to us and encouraging us to adopt her. Cinder has enriched our lives enormously. Hi all you great folks at Save a Dog! 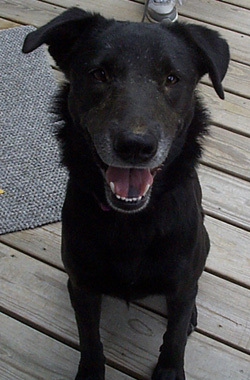 We adopted a 2 year old black lab/shepard mix named Cinder from you in August 2002. We've had her for over 2 years now, and she is the smartest, sweetest dog I've ever known. She fits in wonderfully with our other 2 dogs and enjoys being part of a pack. She plays in our large fenced yard and we take her for regular outings in the conservation lands. She loves to run on the trails and in the woods. 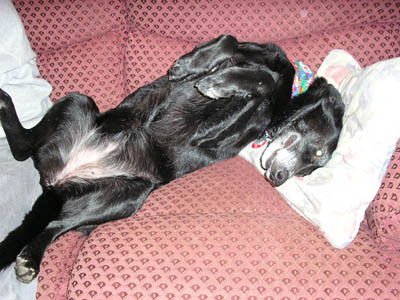 She has claimed a spot on the couch as her favorite napping place and will flip over for a belly rub if you walk by. Cinder knows several commands, is obedient, and soaks up all the attention we give her. She is rarely left alone since I work part-time and if I am gone, she has our 2 other dogs to keep her company. She loves to watch the squirrels on the bird feeder and makes us laugh every day with her antics and her loving personality. We're so glad she's part of our lives! Here are a few pictures of her napping on our couch. P.S. Please remind Shirley that Ruth Brown in North Carolina is the person who found Cinder under a truck when she was a puppy and raised her for her first 2 years of life. We are so thankful to Ruth for giving Cinder such a good start in life. I'm convinced that Ruth's TLC is a big reason why Cinder is such a special lady! Feel free to email this update and the photos of Cinder to Ruth Brown so she will know how Cinder is doing and that we love her immensely. Thank you Ruth!! We wanted you to know how much we are enjoying Cinder. She has a wonderful personality and is doing very well with our other dogs. We have had her out for lots of walks and she has become a much-loved member of the family. Hope the attached photos show her off... her face is a bit brown because she was rooting around in the dirt!